Sagan, V., Maimaitijiang, M., Sidike, P., Eblimit, K., Peterson, K.T., Hartling, S., Esposito, F., Khanal, K., Newcomb, M., Pauli, D., Ward, R., Fritschi, F., Shakoor, N., Mockler, T.
The growing popularity of Unmanned Aerial Vehicles (UAVs) in recent years, along with decreased cost and more accessibility of both UAVs and thermal imaging sensors, has led to the widespread usage of this technology, especially for precision agriculture and plant phenotyping. There are several thermal camera systems in the market becoming more available at a low cost. However, their efficacy and accuracy in various applications has not been tested. 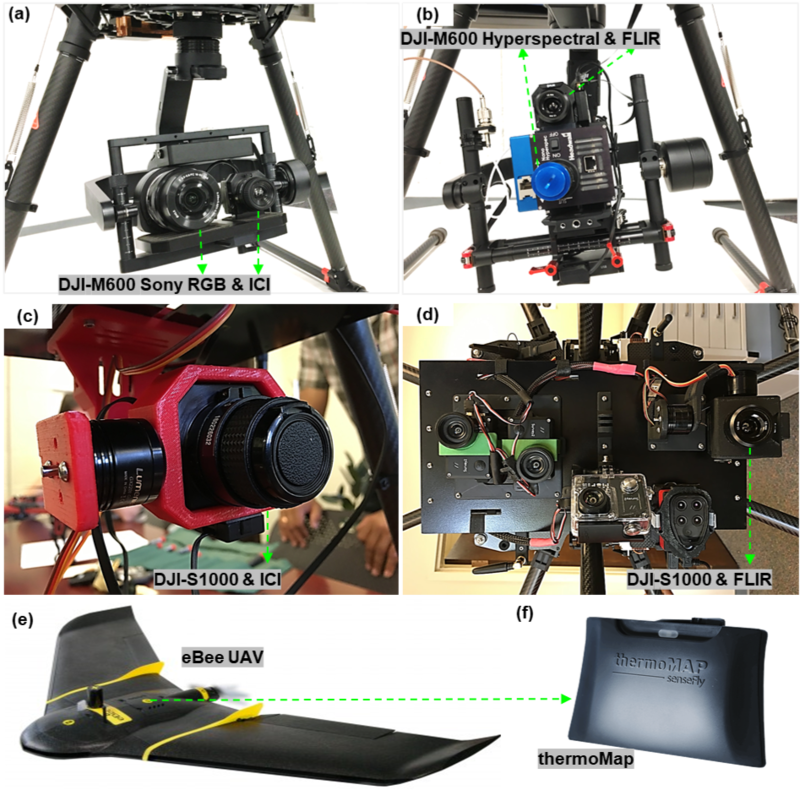 In this study, three commercially available UAV thermal cameras, including ICI 8640 P-series camera (Infrared Cameras Inc., USA), a FLIR Vue Pro R 640 Thermal Camera (FLIR Systems, USA), and thermoMap (senseFly, Switzerland) have been tested and evaluated for their potential for forest monitoring, vegetation stress detection and plant phenotyping. Mounted on multi-rotor systems, these sensors were simultaneously flown over different experimental sites located in St. Louis, Missouri (forest environment), Columbia, Missouri (plant stress detection and phenotyping), and Maricopa, Arizona (high throughput phenotyping). Thermal camera datasets were calibrated using procedures that utilize a blackbody, ground thermal targets, emissivity and atmospheric correction. A suite of statistical analysis including analysis of variance test (ANOVA), correlation analysis between sensor temperature and plant biophysical and biochemical traits, and genotype heritability test was utilized to examine the sensitivity of the cameras against selected plant phenotypic traits and water stress detection. Our results showed that (1) UAV-based thermal imaging is a viable tool in precision agriculture and (2) all these systems are comparable in terms of their efficacy for plant phenotyping. Overall, accuracy when compared against field measured ground temperature and estimating power of plant biophysical and biochemical traits ICI 8640 P-series performed better than the other two cameras, which was followed by FLIR Vue Pro R 640 and thermoMap. Our results demonstrated that all three UAV thermal cameras provide useful temperature data for precision agriculture, ICI 8640 P-series being the best among the three systems compared; but cost wise, FLIR Vue Pro R 640 is the most affordable than other two cameras compared providing a cheaper option for a wide range of applications.